In the spring of 1986, Raymond Carver chose Stages of Twilight for the King County Arts Publication Award. The manuscript was published by Breitenbush Books of Portland, Oregon, in November. In addition, the poems my passion to care for the wild world around me; people have the responsibility to live well in nature. Painting and its ability to communicate through color and shape also inform the book. Stanley Kunitz calls painting “the sister art” of poetry; it has always played that role in my poems and my teaching. Finally, the theme of human rights, expressed through the metaphor of my love of the German language and its people, has its beginnings here. 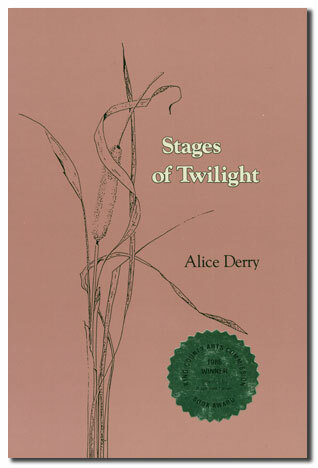 “Derry’s poems are rooted in specifics: the here-and-now of family, nature and memory.” ─Don Fry of The Seattle Times. Cover and frontispiece art are pen and ink drawings by Charlotte Warren of Sequim, Washington. Hardcover, $8.50; paper, $4.50, available only from the author. beam after beam, heavy, white? It takes two men just to lift one. still wet, is acrid, like welcome autumn smoke. skin, ready for the hand’s rub. and the room their roots find. patiently adding its sixteenth-inch rings. When the saw hits on just right, there’s screaming. nature’s calm drop of a cone into logged soil. and staring into the giant hemlocks? Whole trunks move—vulnerable to the tiniest breeze. Now you hold a chainsaw up and dip it gently into a log. hills blue with their haze.